I was glad I had my flash with me. I don’t often use it for birds, but I knew these birds are used to it with all the visitors they receive each year. I was shooting into the sun, and I had to add some extra fill light. 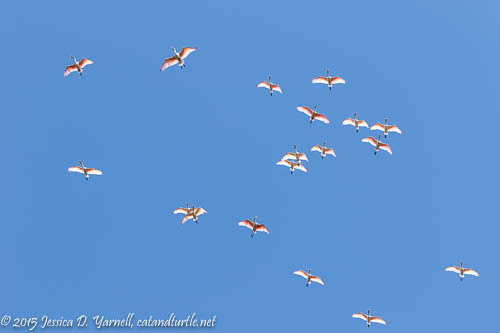 At one point I looked up and saw over twenty Spoonies flying overhead. It was so cool! 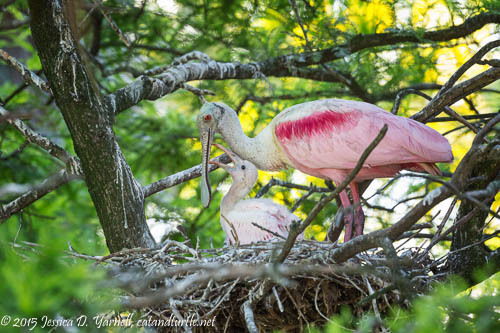 The spoonbills have only begun nesting at the Farm in the past few years, and to see them in such good numbers was very nice. The Spoonbills are one of my favorite birds. 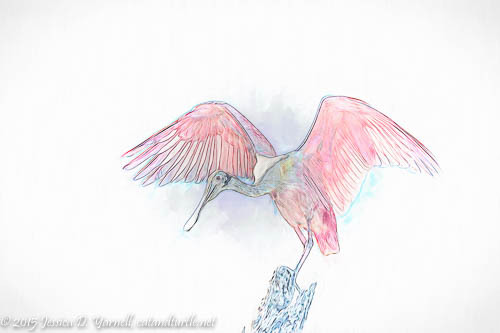 I had a shot of a Roseate Spoonbill as he flew in and landed on a perch, but it was extremely backlit. I took it into Photoshop and played with it with various plugins. Look at those beautiful pink angel wings! Such a great capture with the mom and the baby! It’s enough to have any photographer feeling “in the pink”! Very nice work!